Value Added Tax (VAT) has taken effect in UAE since 1st of January 2018. The tax is laid on most of the services and goods and a rather complete list of tax-affected items was issued by UAE government before implementation of tax. But the list was not a comprehensive one and there was some ambiguity about the effect of VAT on 45 free zones present in all the emirates of UAE. But now it seems that the issue regarding VAT on free zones has been solved after a recent decision by Emirati cabinet. On Wednesday 10th January 2018, the UAE’s cabinet finalized the designated freezones that will not be affected by value added tax (VAT). According to details, there are total 45 free trade zones in UAE. Most of these (27) are present in Dubai and it is the emirate that will mostly be affected by this decision. Out of these 20 designated free zones, only 7 are present in Dubai which means that VAT will be applied on around 75% freezones in Dubai. But luckily, important free zones like JAFZA and DAFZA are in this list of designated free zones which is a sigh of relief for thousands of companies operating in these free zones. Apart from Dubai, there are 3 free trade zones from Abu Dhabi and Ras AL Khaimah each, 2 free trade zones from Sharjah, Fujairah and Umm Al Quwain and 1 free trade zone from Ajman in this list. 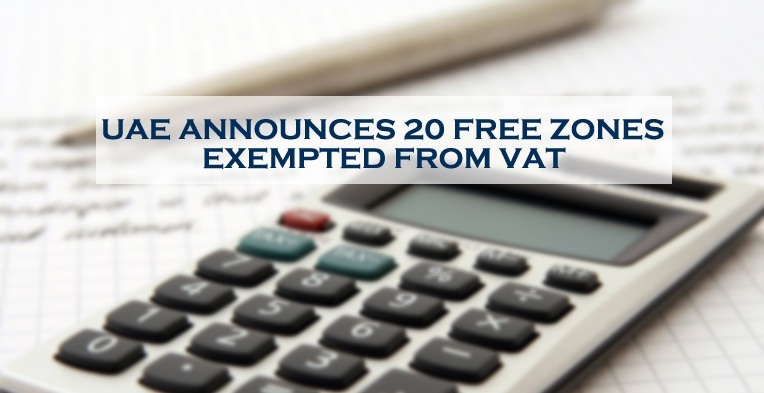 With getting exemption from VAT, these designated free zones will be provided with advantage of remain free from the newly-implemented tax while transferring goods from one area of the designated zone to another area and also from one designated zone to another designated zone. Though, the list of designated free zones accounts for less than half of the total free trade zones present in UAE but most of the free trade zones in smaller emirates are included in this list while Dubai’s most important free zones (DAFZA and JAFZA) are also represented here. This will not only help in the growth of many emerging free zones in smaller emirates but is also helpful for thousands of companies having their businesses in well-established free zones in Dubai. Following are these designated free zones that are approved by the cabinet of UAE. Great! Thanks for sharing the information. That is very helpful for increasing my knowledge.